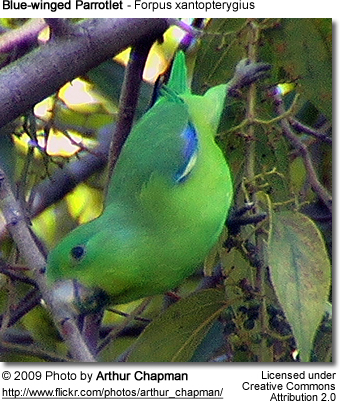 Parrotlets are miniature parrots that are endemic to South and Central America. In their natural habitat, these social beings usually travel in flocks which, depending on the species, can range from as low as 4 to over 100 birds. Their expected lifespan is 20 - 40 years, provided their needs of daily exercise and healthy nutrition is met. 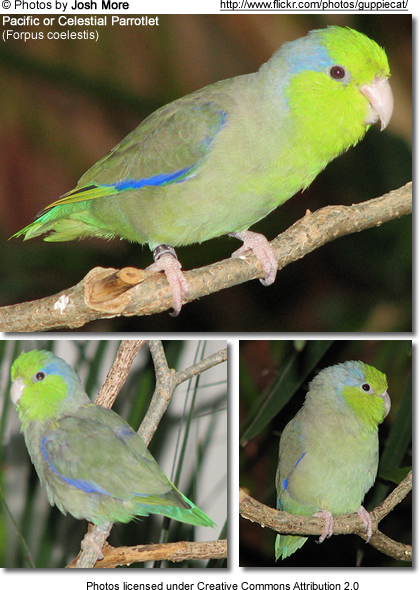 Parrotlets are popular pets due to their compact size and playful personalities. They are very intelligent and active and should have ample opportunities to play and exercise. Their personality is similar to that of the larger parrots and may be quite fearless of larger animals, including dogs, cats and larger parrots - which puts them at danger. They can be very territorial inside their cages and may attack those intruding in its personal space, even humans trying to feed them (this would be the case if they were not properly socialized to start with). Tamed parrotlets can be very affectionate. At 4½–5 inches long, parrotlets are the second smallest kind of parrot in the world - the smallest being the pygmy parrot species of Australasia (averaging around 3 inches in length). Parrotlets rarely grow bigger than 5 inches or 13 cm. The body is stocky and the tail is short and broad. They are quite similar in personality to lovebirds. Cuddly and animated, and with a need for daily interaction with their human "mates" for them to stay tame and loving. They can get quite nippy. Handling in addition to a nice personality is going to determine its pet quality. Since the parrotlet is an intelligent and curious bird, it is important to provide it with plenty of toys and things to investigate in the cage, otherwise it may grow bored and listless. They need suitable things to chew on and tear apart, otherwise they may destroy dishes and similar in the cage. Placing new branches in the cage now and then is a good idea since it will make the environment more natural, give the birds something new to climb on and explore, and provide them with a safe outlet for their chewing urges. 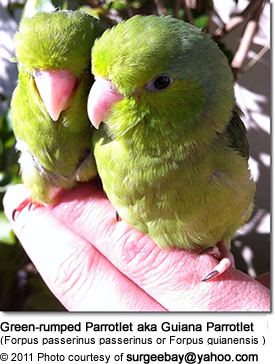 Parrotlets are very social beings and form strong pair bonds. Unfortunately, in captivity, they are often kept as pairs and they may get lonely. If you keep a single parrotlet, it is very important to make sure that enough time is spent with your pet to ensure that its emotional needs are met. Providing a fun and entertaining cage environment (or bird room) helps in keeping a pet busy when you aren't around. Foraging is one way to keep your pet busy and healthy. They have about the same speaking and whistling capabilities of a cockatiel. Some learn to talk, while others never will. Generally speaking, males are more inclined to speak than females. They may to learn up to 10-15 words, and some of them also learn to whistle tunes and sounds they are exposed to. Some parrotlets can learn fairly difficult tricks, but they are usually not as skilled as their larger cousins - the amazons, cockatoos or macaws. (However, they present far less behavioral challenges and maintenance requirements than them as well.) Parrotlets are generally easy to take care of. They are very good learners for commands such as "step up", "kiss-kiss", "step down", and other small commands. Some parrotlets can learn advanced tricks, but not advanced as a macaw or an african grey. Some may get nippy as the discover their beaks as method of "disciplining us." Web Resources: I put together web resources for you to help you understand your pet bird and properly direct him. 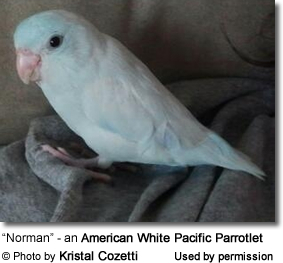 The most commonly kept parrotlet in aviculture is by far the Pacific Parrotlet, which now has several color mutations. The Mexican, Spectacled, and Yellow-Faced are also fairly common pets. Their popularity as pets has grown due to their small size and large personalities. Parrotlets are commonly known as playful birds that enjoy the chewing as much as their larger Amazon Parrot counterparts. However, their largest quirk lies in the fact that they don't grow as bored as other species of parrots. Parrotlets keep themselves more than occupied when left alone for several hours, so long as they are provided with an array of chewable and destructible toys to play with. However, when their keepers get home, they often greet them with lovely chirps and whistles to let them know they want attention. Parrotlets tend to be dedicated parents and are often used as foster parents for less reliable parrotlet species. Their cage should not be smaller than 18" x18"x18" with a bar spacing of 1/2"- 5/8". The smaller the cage is they are in, the more out-of-cage time they should be given. For exercise and entertainment, the cage should be furnished with several perches and toys. They enjoy toys made of leather, rawhide, wood and rope; and like things that move, such as swings on which they may even sleep at night. This cuddly species also enjoys sleeping in birdie tents, which will also keep them warm in cooler nights. However, as parrotlets reach reproductive maturity birdie tents may reinforce aggressiveness, as they are likely to turn it iinto their "nesting spot" and the birdie tent (or happy hut) may need to be removed when this happens. The activities they particularly enjoy is untying knots, chewing on beads and attacking bells.